Fonts are not just text. A fonts is a visual statement just like a carefully chosen image and other graphic elements. 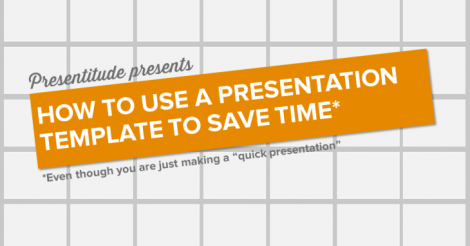 However, when designing corporate presentations that need to travel outside the organization, using a unique font is risky, no matter how beautiful it is. Most fonts can’t be embedded in a template so they must be installed locally for anyone to use and see these fonts. And even if you choose to embed the font, you might not have the rights to distribute the font. Mac versions of PowerPoint cannot use embedded fonts at all. 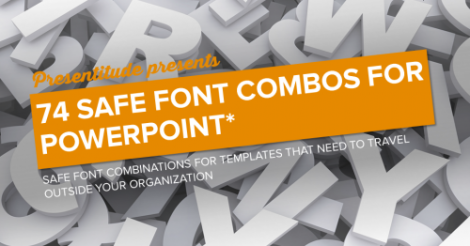 So when creating templates for a large group of users, you should keep your presentation safe by choosing any of the 44 fonts that are most commonly installed* in different PowerPoint versions. We have created two guides – a guide to the 44 safe fonts to use and a guide to 75 font combos (headings+body font) based on these safe fonts. This Presentitude™ guide gives you an overview over these standard fonts, divided in three groups of font sheets: san serifs, serifs and script/display fonts. The guide is interactive – follow the instructions to move among the font sheets. This Presentitude™ guide gives you 74 font combos (headings + body. The combos are divided into four groups: sans serif+sans serifs, sans serifs + serifs, serifs + serifs, serifs + sans serifs. It also has an matrix over view that links to all the font combos. The guide is interactive – follow the instructions to move among the font sheets.